Purchasing a backcountry skiing advertisement on this site is a great way to reach your customers and help the cause. 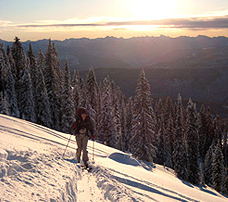 You know that visitors to the site are backcountry enthusiasts who have needs for the gear and services to get them out on their next self-propelled, snowy adventure. Invest in a backcountry skiing advertisement today and don't get scooped! Ads can be purchased and integrated into the site by contacting us via e-mail. All files submitted must be in RGB colour mode, 72dpi, sized exactly as specified below and in jpeg (.jpg) file format only; no other files will be accepted. Only one ad, per ad space/year, is allowed, there will be no substitutions until the ad term expires. Should you have any questions please contact us.